Colourcraft Fabric Pens	There are 2 products. 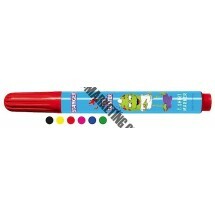 1 * Pack of 6 Colourcraft Fabric Felt Tip Pens - Thick Tip. Assorted Colours. 1 * Pack of 10 Colourcraft Fabric Felt Tip Pens - Thin Tip. Assorted Colours.